Since 1996, the team at T.Q.S. Construction LLC has had one simple goal in mind – Provide our customers with quality, professional work. Our full service construction company will provide superior services for your residential and commercial remodeling needs. We treat each and every job with the individual attention that it deserves. Whether simple painting or additions and new construction, our well-trained team of professional New Jersey remodeling contractors will deliver a top notch product for your project. From homes to offices and industrial buildings, our team consists of a well-rounded group of professionals and contractors with experience in your build type. T.Q.S. Construction LLC is the New Jersey remodeling contractor that can complete nearly any task, from framing through finishing touches and interior design, we do it all. Make our residence your home or transform your commercial space by customizing your property’s look and feel. Including kitchen remodeling, bathroom remodeling, basement renovations, whole home renovation, new home additions, and commercial remodeling, quality renovation services allow you to make your property uniquely yours while potentially increasing its value. Our team of professional New Jersey remodeling contractors can take care of your property, inside and out. Update your curb appeal with quality replacement siding or improve your energy efficiency with new windows and doors. We work to your complete satisfaction. You can rely on our expert staff of professionals to get the job done effectively and efficiently, making sure your project is completed on time and on budget. Our full licensed, insured, and qualified team is ready to go to work for you today. 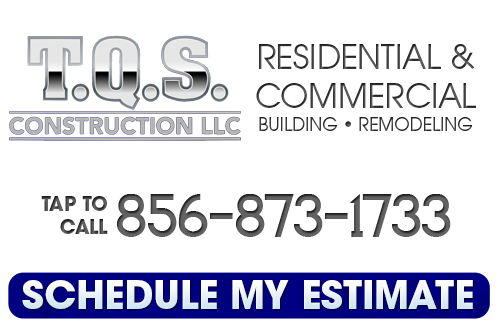 Contact us to schedule your free estimate. If you are looking for a New Jersey remodeling contractor, then please call 856-873-1733 or complete our online request form.